In a football game, a quarterback begins each offensive play with his stance behind the center and his hands under the center. The center snaps the football back to the quarterback, as shown in this figure. He bends his knees, flexes down, and bends forward at the waist until he’s directly behind the center’s rear end. The quarterback then places his hands, with the thumbs touching each other and the fingers spread as far apart as possible, under the center’s rear end. 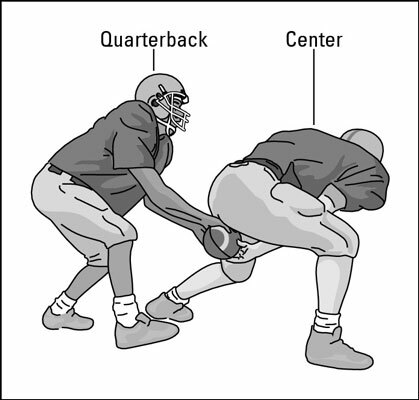 Because some centers don’t bring the ball all the way to the quarterback’s hands, the quarterback will lower his hands below the center’s rear end in order to receive the ball cleanly. The quarterback needs to avoid pulling out early, a common mistake when the quarterback and the center haven’t played together very much. Dropping back is what a quarterback does after he receives the ball from the center. Before he passes the ball, he must move away from the line of scrimmage (and the opposing defense) and put himself in a position to be able to throw the football. You see quarterbacks backing up from center, or backpedaling, when the offensive formation is aligned to the left of a right-handed quarterback. Backpedaling is essential in those alignments so that the quarterback can see whether the linebacker on that side is blitzing (rushing across the line of scrimmage in an attempt to tackle the quarterback). The quarterback must be alert to a possible blitz; consequently, he can’t afford to half-turn his back to that side. If the receiver is running 5 to 6 yards down the field and then turning to catch the ball, for example, the quarterback takes a drop of no more than three steps. The quarterback generally moves further away from the line of scrimmage as the pass routes (the paths receivers take when going out for a pass) of his receivers get longer. For instance, if the receiver is running 10 to 12 yards down the field, the quarterback takes five steps to put himself about 7 yards deep from the line of scrimmage. On a post route (a deep pass in which the receiver angles in to the goalpost) or a streak route (a deep pass straight downfield), the quarterback takes a seven-step drop. Taking a longer drop when a shorter one is required enables the defense to recover and may lead to an interception or an incompletion. One of the most important things for a quarterback to learn is the running game and how it affects his steps from center. Some running plays call for the quarterback to open his right hip (if he’s right-handed) and step straight back. This technique is called the six o’clock step. The best way to imagine these steps is to picture a clock. The center is at twelve o’clock, and directly behind the quarterback is six o’clock. Three o’clock is to the quarterback’s right, and nine o’clock is to his left. For example, a right-handed quarterback hands off the ball to a runner heading on a run around the left side of his offensive line (it’s called a sweep) at the five o’clock mark. When handing the ball to a runner heading on a sweep across the backfield to the right, the quarterback should hand off at the seven o’clock mark.